A well-made home is only as solid as the foundation it sits upon. The city of Cincinnati has a unique geological history that created our hills and valleys. We’re building on a hillside and the Start Small team is taking every precaution to ensure soil stability before construction starts on Peete Street later this year. The site itself is located in Cincinnati’s Hillside Overlay District which requires additional steps to be taken in order to preserve natural hillside features. Although not required for new construction, we’ve consulted with Civil and Geotechnical engineers from C.E.C. Inc. to conduct an investigation that will determine the best solution for a needed retaining wall and foundation type. 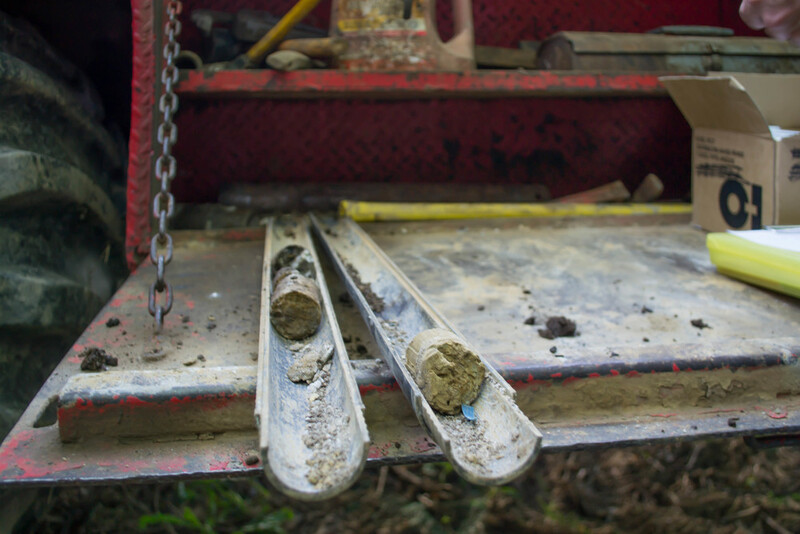 This involved drilling and producing soil-bores which helps engineers better understand the material they’ll be building on. The investigation determined that the entire site has around 5-6 ft. of “fill,” which is soil that has been previously disturbed. Combined with an existing retaining wall on 142 Peete. that has seen better years, we’re constructing a new wall so uphill earth stays uphill. Consulting with C.E.C. and Structural Engineer Jason Jones at THP Limited, we’ve opted to create a new retaining wall that will reinforce the existing structure and create space for the stone patio. Retaining walls come in a variety of styles each with their own set benefits, drawback, and cost. We’re going with a gravity mass wall design that will be effective (and cost-efficient) and appealing. The ground behind the wall will follow the slope of the existing hillside. The Peete Street location has a low probability of unwanted soil movement, but we’re taking extra steps to ensure the new homes will last a lifetime.